Research suggests that an increasing number of people experience organisational changes such as mergers and acquisitions as highly emotional life events. Indeed, given that, as the authors prove, 70% of all mergers and acquisitions fail to reach their initial goals largely because of neglected people issues, it is a must for every manager and M&A researcher to understand the emotional side of such change processes. This fascinating book explains how managerial behaviour and communication styles influence the emotions of employees and affect their readiness to contribute to a successful post-merger integration. 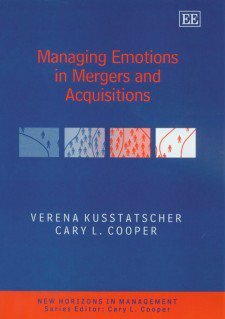 It combines emotion theories from other disciplines with recent M&A findings, and offers practical implications through illustrative case studies. Academics and practitioners will find the combination of management literature with psychology and sociology literature of great interest.